President Barack Obama speaks at a press conference in Washington, DC about a mass shooting at Umpqua Community College in Roseburg, Oregon. “There’s been another mass shooting in America,” President Obama said a few months ago. One could be forgiven for not remembering the exact circumstances that prompted him to say that1 — as of early December he’d made a similar address 13 times. The president at the podium has joined with the rest of the coverage of these horrible events to create a new genre of media coverage. The aimless helicopter footage, the images from national networks’ local affiliates, the photographs that have developed a formal aesthetic of their own, the uncertain casualty count, the ever-present speculation that there may be an additional “active shooter,” the slow crystallizing of details and, eventually, the makeshift memorials and somber candlelight vigils — these days, this all goes by one name: mass shooting. Much has been written about the mass shootings themselves — the roles of gun control, mental health care, security measures and so on. But what of this phrase itself? The way we refer to these episodes of violence also tells us something about the American experience, and the phrase “mass shooting” hasn’t always been ubiquitous like it is today. Over the past few years, it has skyrocketed to prominence, far outpacing the increase in the number of mass shootings. That’s quite a spike — in 2015, there were 17,489 total uses of the phrase. Compare that to 1980, when there were exactly two mentions of the phrase “mass shooting” in printed news — both referred to a massacre in Afghanistan. This year, on the day after the San Bernardino attack there were 802 mentions. I saw a related trend in books — the following chart is from the Google Books Ngram Viewer, for all books in American English that use the term. Again, there is also a strong upward trend, stretching back to early last century, and accelerating around 1980. This trend is not nearly as stark as the very recent increase seen in the Nexis data, but note that the ngram data only goes through 2008. This would all seem to make sense if the number of mass shootings were on the rise as well. And, depending on how you count2, mass shootings have risen, but not nearly at the rate that our use of “mass shootings” has. 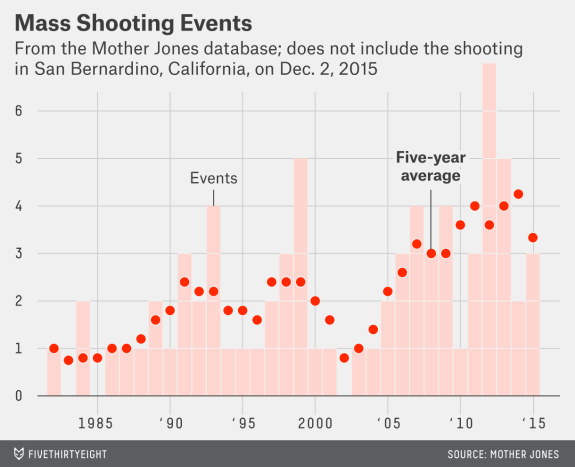 Mass shootings, as defined by Mother Jones and compiled by my colleagues last month, do appear to have increased somewhat. However, this data is extremely noisy, and remember how big the spike was in the other charts. Rather than the phrase being used more often in order to simply cover more shootings, there is likely another force at work — the attention and interests of the media itself. “There does seem to be some, [though] not dramatic, recent increase in mass public murders, which is unfortunately the kind everyone is so afraid of,” Kenna Quinet, a criminologist at Indiana University–Purdue University Indianapolis, told me. The vigorous coverage of these events may have implications beyond just fueling the ubiquitousness of certain language — it may also affect the public’s perceptions of the likelihood of these events, and thus of their own safety. “This sort of Columbine-era breaking news coverage of the latest mass public shooting has really distorted their idea of how many of these events there are,” Quinet said. Data seems to bear out Quinet’s thoughts. The Internet Archive’s TV News Archive shows a general upward trend in the phrase’s usage since 2009. There have also already been 1,301 mentions in 2016, as of Jan. 19. Quinet sees the media’s focus on mass shootings, and thus the flourishing of the phrase “mass shooting,” as merely the next in an ongoing series of sensational crime categories that have been granted the media’s intense spotlight. In the 1980s, for example, it was serial murder. At other times, it has been child abduction. “It seems like we’ve stopped the hyperbole and epidemic talk about serial killers and we’ve switched over to talk about mass killers,” Quinet said. Regardless of its origins, there is no hard-and-fast reason for the phrase’s current dominance. “You can’t point, I don’t think, to specific motivating factors. It feels like it’s kind of a confluence of things that are coming together to anoint this term as what we’re calling it these days,” Zimmer said. But the media’s attention, and phrases of a given moment, are mutable. “Mass shootings” — and, one hopes, mass shootings — may wane. But, like nature abhors a vacuum, the media mill abhors a lack of grist, and it remains to be seen what events will become the next focus of attention. “What’s the next crime phenomenon that’s going to be hyped?” Quinet wondered. Obama’s utterance above came after the shooting at Umpqua Community College in Roseburg, Oregon, in October that left 10 dead. We should pause here to note that official present-day definitions, to the extent they exist, of “mass shooting” vary. Gun Violence Archive considers a mass shooting any case where at least four people were injured or killed. The magazine Mother Jones has also undertaken a tracking project, with a somewhat stricter definition — it counts incidents that occur in public, don’t involve gangs or robbery, and where at least four people excluding the shooter are killed. The FBI eschews the phrase, and instead tracks what it calls “active-shooter events” — events where “an individual actively engaged in killing or attempting to kill people in a populated area” — regardless of the number of people shot. “Mass shooting” does dwarf “mass murder” in the present-day media. There were 17,489 mentions of “mass shooting” in 2015, compared to 5,799 mentions of “mass murder,” according to Nexis.